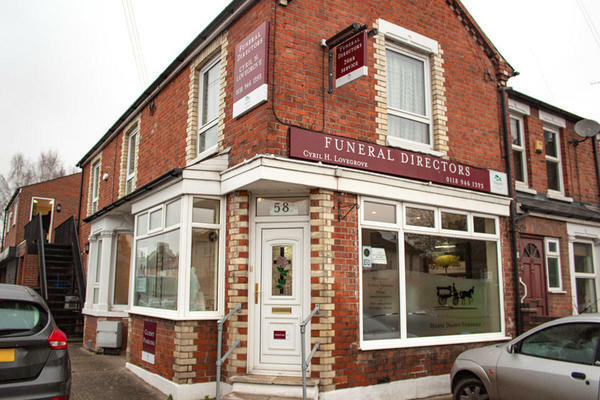 We are Cyril H Lovegrove Funeral Directors in Caversham, Reading. Our history of caring for families dates all the way back to 1875. It has been a privilege to serve our community with expertise and uncompromising compassion for all this time. From a cremation service to woodland and green burial, whatever type of service you need, it will be carried out with kindness and respect by our devoted team. As your local Dignity funeral directors, we want to make a difficult time a little easier for you, so we will listen to your thoughts with care, honouring any wishes that you have. Every detail that matters to you is important to us, because we want the funeral to be a unique and personal celebration of your loved one's life. Please call us at any hour and we will be there for you every step of the way. Call us today on 0118 946 1393 to talk through your personal requirements. There is free parking is available at our branch and on surrounding streets. We are located on the junction of Briants Avenue and Marsack Street. Our staff are available 24 hours a day on 0118 946 1393 if you require our services outside of these hours.